Regularly updated. Compelling messages. Reader-focused. Search engine optimized. Good website content is all of these things and more. The content on your website works hand-in-hand with your design to tell your story and effectively communicate your goals. Copy development is an important piece of a strong online strategy. Thus, it is surprising how often copy errors appear in web content. A good copy writer knows to avoid common misspellings and grammatical errors. However, even good copy can be guilty of errors on the Internet. Why? Because writing for a website is very different than writing for hard copy. The words, phrases and formatting that work well in your sales brochure likely don't communicate effectively on the Internet. Studies show that people read websites differently than they read print materials. Literally - their eyes move along the page in different patterns. When writing for a website, here are three common mistakes - and the best ways to avoid them. The majority of visitors to your website are not reading the majority of your words. Some studies show that only 25% of the words on a web page are actually read. What are those visitors doing? They are checking out the navigation, looking at pictures and scanning the page. More specifically - scanning the left side of the page. Don't load your page with paragraph after paragraph of information. No matter how important it is - your point will be lost on the website. Do create copy that is full of subheads and bullet points to present easily digestible chunks. The content on the page above needs to describe a wide variety of products. It would be easy for this page to get bogged down in content. Instead, the content is divided into short paragraphs, each with its own subhead. It is designed for scanning and far easier to read. It is designed for a web audience. It's not about you - it's all about them. And when your competitor's website is literally a click away, you need to make sure you're grabbing attention and hitting on the right issues. On the above example the CTAs do double duty - they break up the page making it easier to read AND they give the reader choices on where to go or what to do next. 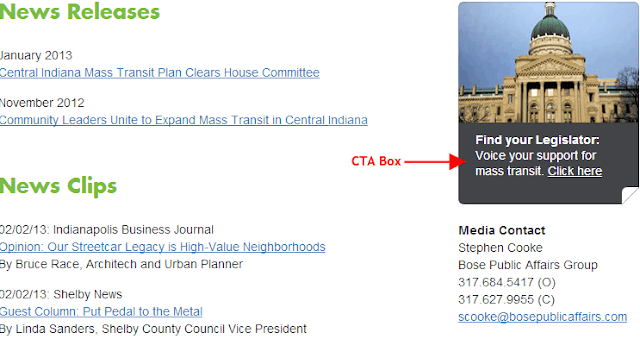 Notice how each CTA has a different look and feel based on where it appears in the page. The elements work together nicely but could also be used individually. Calls to action don't always work best in the body of the page. Here's an example of a page (with clear subheads) that is by its very nature full of CTAs since most of the content links to additional information. There is still a chance to make sure the reader takes the next step after reading these additional articles and that is by designing a graphic CTA box for the right column. In summary, write for the way people use the Internet. Keep your audience top of mind. Don't leave your readers hanging. The Internet is a unique medium for communication and we can help.